A pair of pedestrians and two cyclists were struck by vehicles across Peel Region Thursday morning in four separate crashes — one of which is a hit-and-run. Three collisions took place within six minutes, say Peel Paramedics. Luckily, three victims have minor injuries. 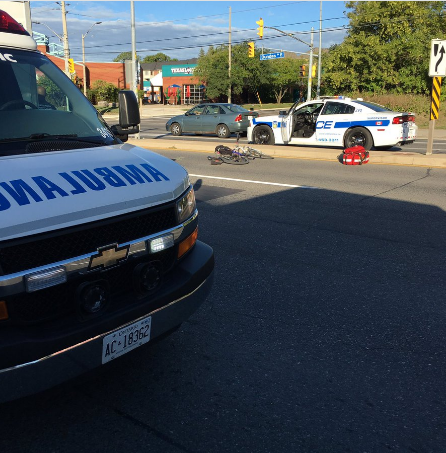 An elderly woman was cycling at Dundas St. E. and Haines Rd., where a call came in at 7:55 a.m. The woman has cuts and heavy bleeding, however, her injuries aren’t life-threatening. Minutes earlier, a woman on foot was struck in Cooksville at Hurontario St. and Paisley Blvd. at 7:52 a.m.
Further north, two crashes took place in Brampton, both involving elderly men, one of whom was on a bike. The cyclist was hit near Queen St. W. & Haggert Ave. N.
It’s unclear if his injuries are serious. Police are looking for the driver of the vehicle, which fled. The other victim was hit at Van Kirk and Wanless drives. Anyone with information can contact police at (905) 453-2121 or Crime Stoppers 1-800-222-8477.